I love boobies. I mean, who doesnâ€™t? Unfortunately for those of us who have them (or are avid fans of them), breast cancer affects 1 in 8 women. 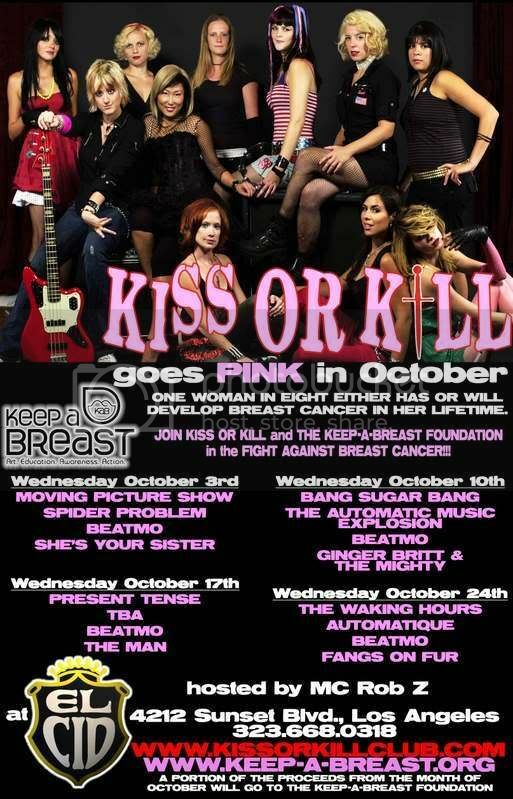 This Breast Cancer Awareness Month, the Keep a Breast Foundation is teaming up with local LA music community, Kiss or Kill, to present a month of concerts aimed at raising awareness and money to go towards breast cancer research. Kiss or Kill, a collective of local bands, has been bringing cheap, community-driven punk shows to the LA music scene every week for the last 5 years. This month they go pink, with every show featuring female artists and musicians (reminiscent of their former monthly â€œAll Grrrrl Rock Riot!â€�). Proceeds from all the shows, as well as a limited release compilation album featuring all of the participating bands will go to benefit the Keep a Breast Foundation. Additionally, each of the women (including members of Bang Sugar Bang, the Mullhollands, Underwater City People, and more) will be having a plaster form made of their torsos to be customized by artists and auctioned off to raise consciousness and funding for research and treatment at an event in early November. Monkeys, waterfalls, and Packers! OH MY!